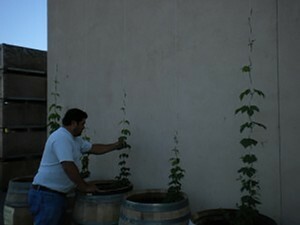 We're pretty excited about our little hopyard this year. We planted the rhizomes on April 9, just about 6 weeks ago, and they're growing like crazy. The organic rhizomes we planted were purchased from a farm up in Oregon. The rhizomes are basically just cuttings, and look like dormant roots when you stick them in the ground. A couple of the varietals had us wondering which end was up, and I was actually worried that we stuck a couple of them in the ground upside down. In the end, we got 'em all right, and they are very happy plants. 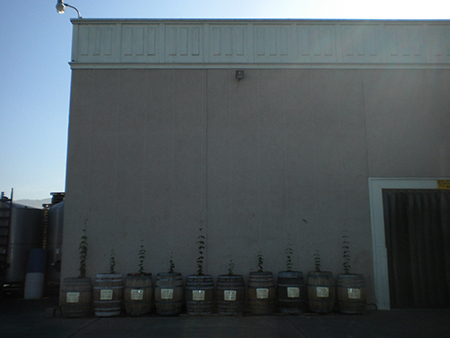 We're growing our hops in barrels alongside the west end of the winery building. It's a lot easier to train the hops up a string trellis from the roof than to construct a proper hopyard with poles, which may need to be 15-20 feet tall. The growth below is all in the last 6 weeks (from dormancy), so we expect that the hops will work their way up near the roof by the end of the growing season. 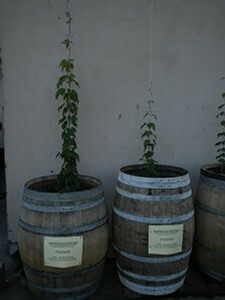 We've got 2 barrels each of 5 different 'varietals' growing. Fuggles, Northern Brewer, Cascade, Willamette, and Perle. We're really looking roward to watching them grow this season, and learning about incorporating our own homegrown hops into our homebrews. All the guys in the cellar have taken a real ownership of the project and it's been a fun team-builder in the ""offseason"". Each of us planted two hop plants, so we've all got a horse in the race. It's kind of like the game at the carnival, where you shoot water in the clowns mouth to see who can get the whatever up to the top of the line first. In this game, we all win because we'll get to brew some tasty batches at the end of the season! Last week, we shipped out the second and last of our original two presses. These presses were purchased in 1981 & 1982, and we used them faithfully for 25 years until they finally gave out after the 2005 harvest. We replaced them with a single 50hL Diemme bladder press in 2006, which we are very happy with. Still, I'm kind of sad to see the old equipment go out. 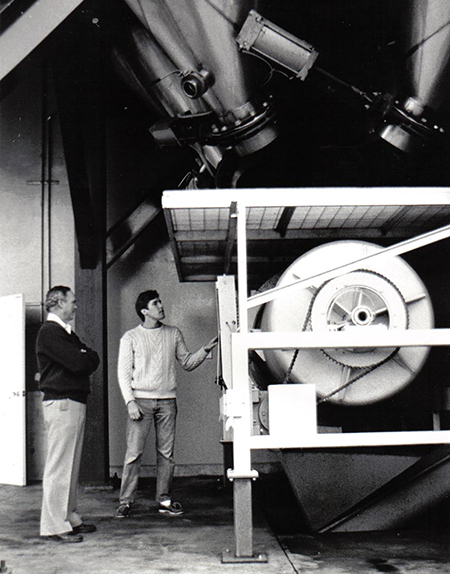 Our dad was about my age, 38, when he came up to Napa and started our vineyard business. It would have been an exciting time for him, and probably spiced with a little anxiety. It would have been a large undertaking for a young man, and Napa in 1969 wasn't a guarantee. Keep in mind that Robert Mondavi Winery was only started 3 years earlier, in 1966. 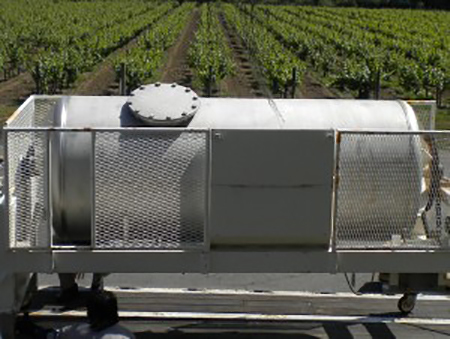 When our winery was built in 1981, our dad had about 11 years of grapegrowing behind him, so he was primed for making his own wines from the vineyard. These presses were some of the first equipment purchased. I personally have spent countless hours crawling around inside these old presses, going back to 1990 when I started full time. At least twice day, the screens would need to be installed and removed, and they were a bear to clean. We had a kind of stainless steel toothpick that we would use to get the seeds out of the slots. That being said, those our some of my fondest memories of my early days on the crush pad. There's nothing better than being covered in sticky grape juice, a beard full of seeds, and sweatin' your stones off in a wine press sauna cleaning heavy metal screens. Seriously. The best cold beers in my life have been after I crawled out of those old presses. The life span of these old presses is not unusual for us. We've been careful over the years to take good care of our equipment and make it last, sometimes for decades. When you work with a big piece of equipment like this for the better part of two decades, and you spend the amount of late night and hot afternoon hours with it as we have, you grow attached to it. So we're sorry to see the press go. That being said, we're happy that it has found a new home through the work of our good friend Mark Burns, who has arranged for our old press to be a centerpiece of his winegrowing display, which will be featured in the George H.W. Bush Presidential Library, opening this September.